"Life is too short to squander it doing things you have absolutely no passion for." I do not know who said that, but I keep it in front of my desk to remind me what my priorities are whenever I feel lost or wonder about life's meaning. This is not another page about how to build a website or about how to get rich quickly. Anybody can put a site online these days, and there are never ending offers of get-rich-quick schemes out there. But the majority of website businesses using cheap hosting plans fail in less than a year (I have been there before); same with the get-rich-quick schemes. They simply don't work. This page is about how I am living out my dream of building a successful website. Perhaps you can live that dream, too. Since my site went live, many people have complemented its look and feel--how 'slick' it looks. Little do they know that a couple of years ago I didn't know the first thing about creating a web site. I used my laptop for emails and browsing the web. If anything went wrong with the computer, my husband would come to my rescue. I knew very little about computers, preferring to paint or travel. I knew people made money on the web, but I never thought that I could do that as an artist/teacher. Still, I was looking for a change. I have taught private lessons in my home and group lessons at a local community center, and I enjoy teaching, but I wanted to devote more time to my painting, and also to travel. The question was: how could I share my knowledge of drawing and painting and have time for the other things as well? 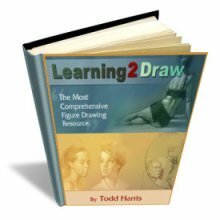 How could I reach large numbers of people who want to learn how to draw and paint? And could I generate income in some way besides selling my paintings? It took me almost two years of searching before I saw the light at the end of the tunnel. I looked at all kinds of small business opportunities, and I soon realized that having a web business could be a viable way to generate an income; I didn't have to take a 9 to 5 job. I learned the internet jargon as I went (SEO, HTML, etc.). As I looked more deeply at web businesses, however, I realized there were a lot more steps to creating a successful business than I had realized. I felt overwhelmed and confused. The get-rich-quick crowd promote thousands of different “quick and easy” ways to make money. When you look into it, however, you find they take your money without ever really showing you how to go about it. Or, after they sell you the first product, they try to sell you an endless succession of add-ons and enhancements that you need to make the first product really work. I did not have the time to figure out how to put all the parts together to create a successful on-line business, and I didn't want to spend thousands but end up with a site that didn't draw traffic. Somehow I KNEW there had to be a better solution, and I would find it if I just searched long enough. After repeated attempts at creating an online business, and spending lots of money on e-books and worthless programs, I wanted to give up. Then one day I read a free e-book ''The Affiliate Masters Course” by Ken Evoy. I had downloaded it some time before, but hadn't paid much attention to it until that fateful moment. I could relate to Ken's story of leaving a successful career (as a medical doctor in Canada) to pursue a better life as a businessman and entrepreneur. I was struck by his vision of building success by helping people pursue their dreams. I already had some concept of what an affiliate is and how that might help a person make money online. But I was particularly drawn to Ken's vision of “over-delivering” quality information on the web as a way to build traffic (and eventual success) for an online business. He was more like a sincere professor than a salesman. I read that e-book twice; it has more 150 pages--talk about over-delivering! As I learned more about Ken and his approach to building an online business, I realized I had finally found what I was looking for. Ken's “SiteBuildIt!” (SBI! for short) product, combined with my knowledge and enthusiasm for art, gave me what I needed to begin building a successful online business. A comprehensive guide (in both written and video form) that takes a user through ALL the steps needed to develop a successful web business. A business with integrity. SBI! really provides a complete package of tools at a very reasonable price. No bait and switch; no special tools you need to really make it work. Add-on products are helpful, but usually not necessary. In fact, several former add-ons have now become part of the core product. And no hype! SBI! is not a get rich quick scheme. They over-deliver with their product, but don't pretend that it will automatically create a successful site for you. SBI! comes with great support. I have had fantastic experiences with both the direct support from the company and also from the online community. The latter, in particular, is a tremendous resource. No matter what question you have, chances are someone else has asked it before, and you can often find the answer by searching the SBI! forums. A verifiable track record of success. In a recent study using Netcraft and Alexa data, it was found that 35% of SBI! 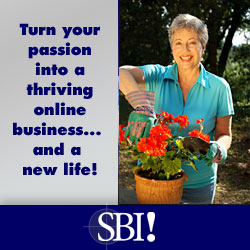 sites are in the top 1% of all sites on the web, and 62% of SBI! sites were in the top 3%. Compare that to your current web host's performance! After I read “The Affiliate Masters Course,” I read some other free e-books by Ken Evoy. Six months later, I was ready. I signed up and started to build my site. At first I was overwhelmed, but I gathered confidence as SBI! walked me through it with step-by-step videos. If I didn't understand something the first time through, I went back and reviewed it until it made sense. I could learn at my own pace. I have been pleasantly surprised that the learning curve is actually quite manageable. So far the most 'difficult' thing I have had to learn is some simple HTML code. Most of the time that I spend working on the site is used to brainstorm new topics to write about or putting together the instructions that I want to post. The technical side is easy, because SBI! does so much for me. My online traffic has grown steadily, and it continues to grow. I have the privilege of interacting with people from all over the world who have the same passion for art as I do. As my site grows, SBI! is helping me turn a passion for art into a lifetime of financial independence. Explore-drawing-and-painting.com is now bringing in enough income to pay for my art supplies and the workshops I attend. I'm certainly not the only one experiencing success with SBI! ; watch some of the videos from real people who have succeeded on this path and you will be amazed at the breadth of subject matter, nationality, and style. Whatever your interest, there is probably a way to develop a successful website around it, and SBI will help you find it. The sky is the limit...when you have the Right tools. Seeing the many thriving SBI! sites I know that success is not just for celebrities and the already-wealthy; neither is it a matter of dumb luck. It is an achievable dream. I provide the enthusiasm and desire, and SBI! 's tools turbocharge my efforts. Do you have something you are passionate about? Want to share it with others and make some extra money from it? Give SBI! a try and see for yourself how it can empower you. Developing my website has been an exciting journey...for the first time I feel I am in control and on my way to financial freedom. I wish I had known about SBI! when I first thought of putting my art on the web--it would have saved years. I hope that the path to your dreams will be shortened because you took the time to read this page and try SBI! Below are some short testimonials from real people whose lives have been changed by Solo Build It! "When you first start, you think... 'Ok, maybe I will make some extra money.' I never really thought that SBI! would help me 'Live my life like I mean to live it'." Click here to hear her life changing adventure. "I now have a business that I can grow over the years. A business that is fun. I'll never do a 9 to 5. I'll always own my own life. That, more than money, more than learning about the Web, more than anguilla-beaches, more than learning how to write well, that is the most important thing I've learned from SBI!. Own your own life. If you don't, what's the point?"